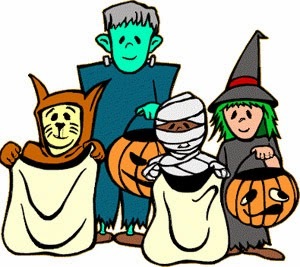 Costume shopping: Help kids pick out costumes that fit properly, keep them warm and are bright. You want your children to be comfortable and visible to other trick-or-treaters and drivers on Halloween night. Supervised trick-or-treating: Make sure your children have a responsible adult to accompany them on their trick-or-treating adventure. Skip houses that don’t have lights on and don’t approach unfamiliar animals. Pumpkin art: Encourage young children to decorate or draw on their Halloween pumpkins. Young children shouldn’t use knives or sharp tools. Use a flashlight or other battery light instead of candles. Candy checks: Children get excited about their candy hauls; keep them happy hauls by checking their treats before they eat them. If your child brings home fruit, make sure to wash and cut before eating. Avoid choking hazards for children under five by removing treats like hard candy, popcorn, and nuts. Halloween driving: watch for children at crosswalks and for trick-or-treaters darting into the road.